We have a tie! The two-time European Champion Suard-Red Jordan Irène and the two-time World Dairy Expo Champion Strans-Jen-D Tequila-Red each ended up with the same number of points in our judging system, a tie for first place. And as the tie-breaker goes the way of the popular vote, the end result sees Irène become the new Red-Holstein World Champion. 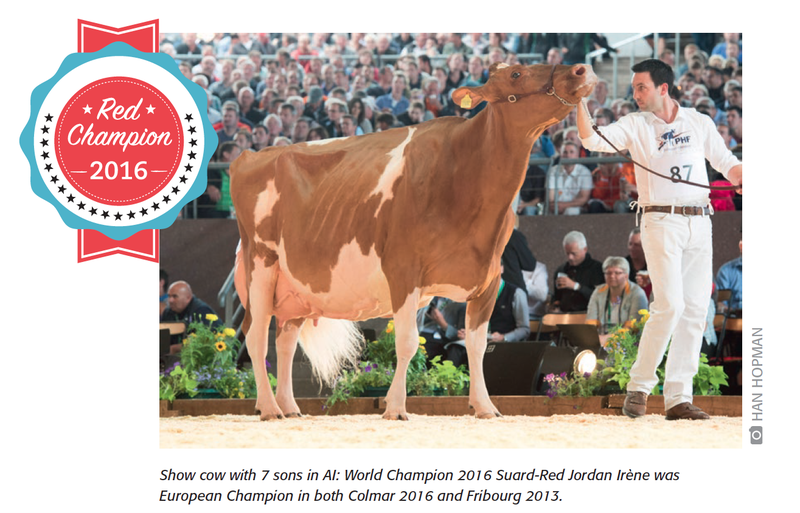 Suard-Red Jordan Irène EX-96: The reigning European Champion from Colmar is now also World Champion. The two-time World Dairy Expo Grand Champion Strans-Jen-D Tequila-Red EX-95 was the first choice of our official judges. Bopi Talent Lotanie EX-93 was Grand Champion from Expo Bulle and gave Switzerland a second cow in the top-3. She’s the oldest World Champion in the history of the competition, the superuddered 12-year-old Irène. And she gives Switzerland its third World Champion in the past five years! However, her victory was anything but straight-forward with the final decision coming down to a tie-breaker. This year, readers voted in record numbers so that they would have their say in selecting the Champion, and right from the start as the votes rolled in, Irène took the lead. From all votes, 63% went to Irène. Indeed, in all six languages and from all parts of the world, Irène was a clear winner. Equally convincing was the distant second place to Tequila with 16% of the votes, while Lotanie was third with 8%. However, that’s only half the story, with the other half belonging to our two official judges. For Irène it was the second time she had appeared in the World Champion competition. She also competed in the 2013 final after winning the European Championship in Fribourg. On that occasion she was also the favourite among our readers, but did not fare so well with the official judges and ended up in second place overall. Remarkably, she improved with maturity in the intervening years and never looked as well as she did this time as a 12-year-old when she won the European Championship in Colmar. Irène is the pride and joy of the Schrago brothers, Damien and Frederic, who farm at Middes in Switzerland (their herd report appeared in HI 2/2016). They purchased her during her first lactation with a view to her becoming a potential bull dam. She was 3rd in her class at the European Championships in Cremona 2010 and over the years has accumulated numerous awards at National Shows, including the best udder title at every show she attended. The EX-96 Jordan daughter has 7 sons in AI and has produced over 95,000 kg milk. Among her daughters are an EX-92 Mr Burns daughter and an EX-93 Italia daughter. ‘Last lactation she easily completed a record of more than 15,000 kg with 4.93% fat, never rose above 50,000 somatic cell count, and readily became pregnant again,’ explains her proud owner Damien. For Tequila, it was the second year in a row that she had been a factor in the final judging, placing third in 2015 before moving up to second this year. And incredibly, she leaves the impression that she can develop into an even more formidable contender over the years ahead. ●Holstein International would like to thank the sponsor of this competition, ABS Global, as well as the official judges – Torben Melbaum from Germany and Hank Van Exel from the US – for their enthusiastic cooperation. Our gratitude also goes to the many readers who helped select the new “Red-Holstein World Champion”. her age! 12 years and looks like a million bucks. Successful in the showring and as bull dam. And so vital for her age, crazy! Lots of type, lots of production, lots of progeny, lots of supporters! Tequila is a great cow with wonderful depth of body and a fabulous udder.